On Thursday 11 October any child that played an instrument was invited to join in a free musical event led by Dudley Performing Arts. Parents and staff were also invited to take part. Staff from DPA brought a variety of instruments with them and set up in the school hall. 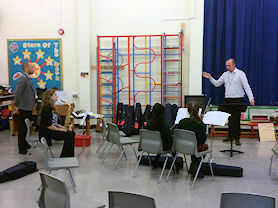 The session began with a real treat, with the professional musicians playing a really lively piece of music. The twenty children and adults were then split into two groups – those that could play an instrument and those that were non-players or just beginning to play. 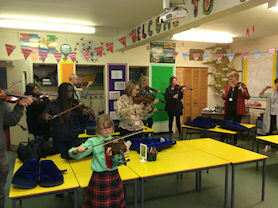 Mrs Pennycooke took the non-players into a classroom, where the group (which included the parents and staff) were taught to play a couple of note on the violin. They learnt how to hold the bow and violin and how to play a simple pattern of sounds. 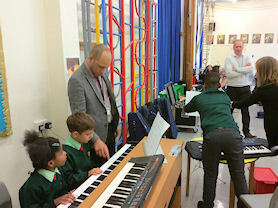 In the hall, Mr Jones, and the other DPA staff, worked the others who could play their instruments. 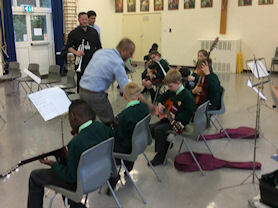 There were small groups of violinists, keyboard players and guitarists who each learnt a small section of music. When all the groups came back into the hall, the various musical sections were put together. The end result was a combined instrumental piece which was very exciting. Everyone who took part had a great time, whether they were able to play an instrument at the start of the session or not! It started with DPA staff playing. 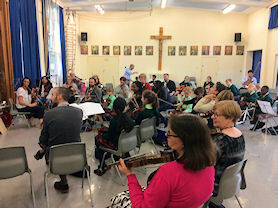 The non-players and beginners learnt their parts on the violin. The guitarists learnt their part. The keyboard players were taught their part. The leaders had a special part to learn. 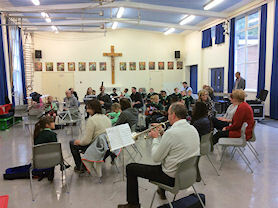 Finally, children, parents and staff joined with DPA to play a rousing piece of music.